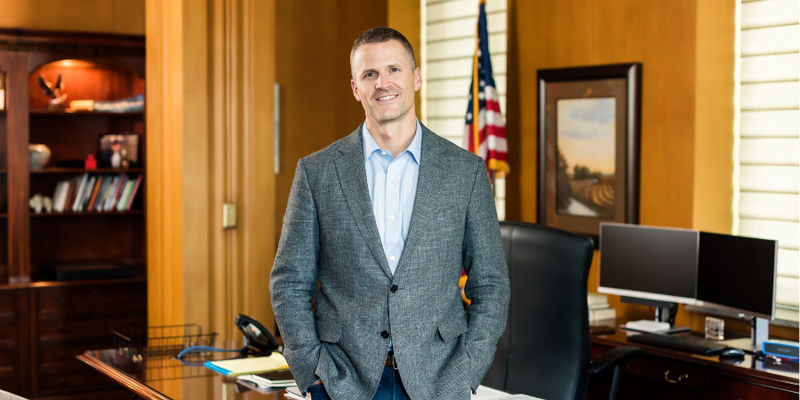 Sioux Falls, S.D., Mayor Paul TenHaken prioritizes building a more innovative culture in City Hall. When you first hear the backgrounds of the eclectic group of people working on transportation solutions in Sioux Falls, S.D., it sounds like the setup to a joke: What do a librarian, a fire captain, and a business analyst have to do with transportation? But when you see this cross-departmental group huddled in its “War Room” working jointly with residents to fill up poster-size sheets of paper with ideas by the dozens, it’s clear that this is no joke. In fact, it could be the future of how City Hall teams work across silos to better solve problems. One recent afternoon, the Sioux Falls group discussed ideas that were pretty novel for a mid-sized city where bus service is spotty and used, primarily, by those who can’t afford a car. They talked about how dynamic routing might reach more riders and improve the bus-riding experience. They brainstormed ways to leverage Lyft, the ridesharing service that arrived for the first time in Sioux Falls 18 months ago. And they explored how the city might engage employers, nonprofits, and housing developers in new ways to help people get from home to work and back. That’s exactly what Mayor Paul TenHaken had in mind four months ago when he pulled this group together. TenHaken is an entrepreneur who started a successful digital marketing business in Sioux Falls. Since he became mayor last May, he’s made a top priority of building a more innovative culture inside City Hall. The transportation group — what everyone simply calls the “Core Team” — is a good example of how he’s doing it. TenHaken, 41, entered office with lots of ideas from his private-sector days about how to build an innovative culture. He said it all went into overdrive last summer. That’s when he joined 39 other mayors to kick off a yearlong executive training program through the Bloomberg Harvard City Leadership Initiative. TenHaken was struck by hearing other mayors talk about their innovation teams and chief innovation officers. Sioux Falls had nothing like that. The Sioux Falls Core Team meets in its ‘War Room’. He went home and changed that almost immediately. TenHaken busted up what had been a grab-bag department called Central Services, moving responsibility for things like the vehicle fleet and facilities management to other agencies. He rebranded what was left as the Department of Innovation and Technology, giving it a more strategic mission and recruiting Jason Reisdorfer, the operations director of another fast-growing local company, to lead it. Reisdorfer has just hired the city’s first-ever innovation coordinator to work across departments to deliver better results. A lot of the culture change TenHaken is going for comes down to keeping the 1,300 people who work for the city motivated. One small but visible change: He’s adopted a more flexible dress code like what he saw in the private sector. City Hall employees are now told to “dress for your day,” which can mean jeans around the office, but more formal attire for business meetings. One of the biggest things the mayor brought over from his private-sector days is a tool for measuring employee engagement. Every few weeks, city employees get a short survey and rate, on a scale of 1 to 10, things like whether they feel their opinions are heard at work, or whether they’re able to take a break when stressed. TenHaken gets dashboard scores for different agencies, giving him insights into where managers can improve. For example, after the Parks & Recreation Department scored low on communication with employees, leadership started holding quarterly meetings to give employees more insight into where the department is headed. The most audacious piece of TenHaken’s innovation agenda is happening two blocks down the street from City Hall, on the third floor of a new city office building. That’s where the transportation Core Team meets every Friday for two hours over lunch. 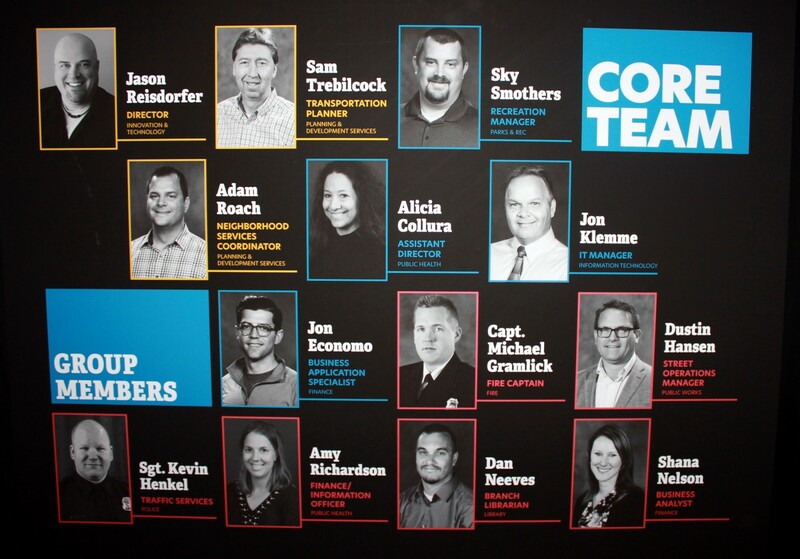 Members of the Sioux Falls Core Team come from nine different departments. The’ve set up their War Room in a cavernous unfinished corner of the building with huge windows, a raw ceiling with exposed steel beams and ductwork, and a shiny gray concrete floor. Most of the vertical spaces, from the walls to the windows to the bulletin boards erected on huge wooden stands, are colorfully plastered in sticky notes. The result is a sort of pick-up team of creative people from across local government. Departments represented include Finance, Fire, Innovation & Technology, Library, Parks & Recreation, Planning & Development, Police, Public Health, and Public Works—there’s one transportation planner on the team, who is able to inject subject-matter expertise when it’s needed. Core Team members dedicate three to five hours a week to the project, alongside their day jobs. The method they’re using to tackle transportation in Sioux Falls is called “human-centered design.” With coaching from Brianna Sylver, a Chicago-based designer on assignment with Bloomberg Philanthropies, the Core Team is trying to flip the script of how local government handles problem solving. The idea is to approach transportation without any assumptions about what’s broken or how to fix it. That’s really hard to do in a city like Sioux Falls, where obvious holes in the system — such as a lack of bus service on Sundays — can descend quickly into old and hardened debates about whether there’s enough money to fund new service or enough riders to justify it. 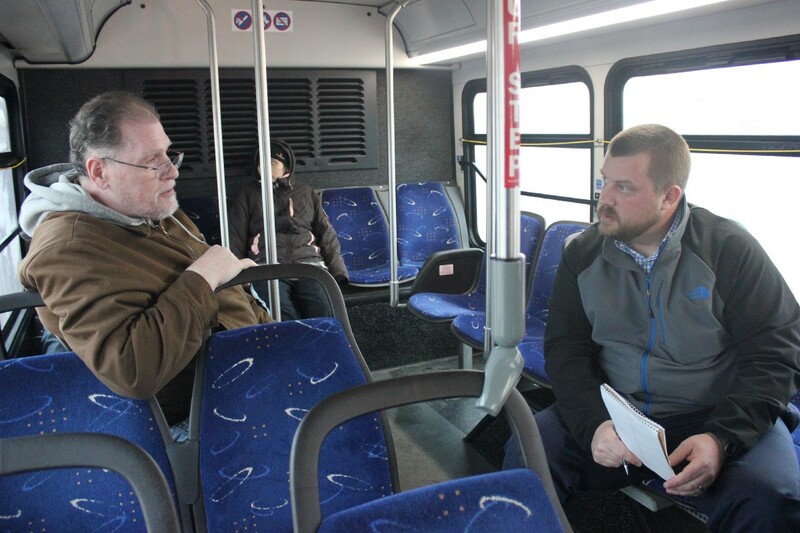 Sioux Falls’ Sky Smothers (right) interviews a bus passenger as part of a ‘human-centered design’ approach to improving the city’s transportation system. Instead, the team is taking a more open-ended approach. Before jumping to solutions, they worked to deeply understand transportation problems in Sioux Falls, from the perspectives of the people impacted by it. The Core Team identified stakeholders such as bus riders, employers, and people who don’t ride the bus. And they split up to interview dozens of people from each stakeholder group, both out in the field and in conversations in the War Room. Sky Smothers, a recreation manager with the Parks & Recreation Department, was one of a few team members who spent an afternoon riding city buses and interviewing passengers about their experiences. It was valuable to hear directly from riders about the city’s transit service, Smothers said. He also found the experience of riding the bus himself helped him better understand the needs of the people who ride it every day. Following their field research, the Core Team assembled in the War Room. They scribbled hundreds of takeaways both big and small on sticky notes. Looking for patterns in what they’d learned, they synthesized key insights such as how long bus rides take, or the potential for public-private partnerships to fill service gaps. Along the way, they held their tongues when solutions came to mind — they needed to understand the problem first. Meeting with the team a couple of weeks ago, Sylver acknowledged that’s hard to do. Dozens of ideas flowed at an ‘ideation’ session. 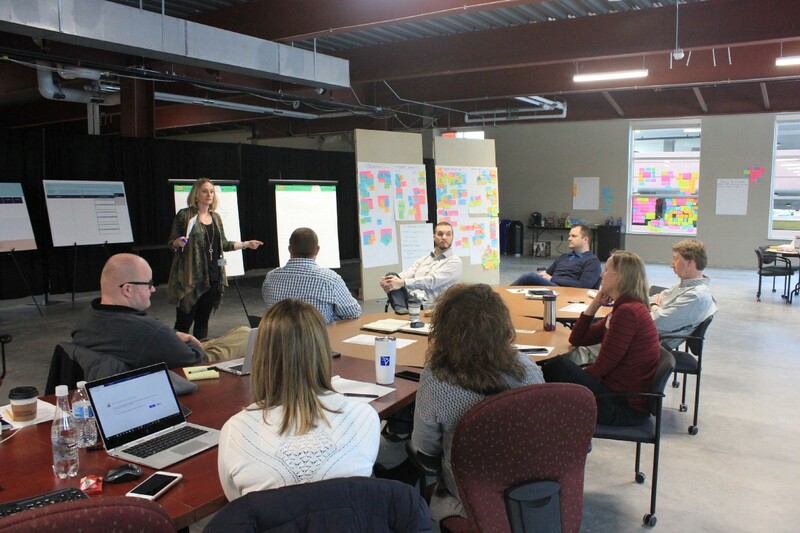 On this day, the team began moving toward solutions, through a process called “ideation.” Four Sioux Falls residents, including one who uses a wheelchair, joined them. Seated in small groups around tables covered in brown butcher paper they could draw on, they bounced ideas off each other and built on one another’s thoughts. 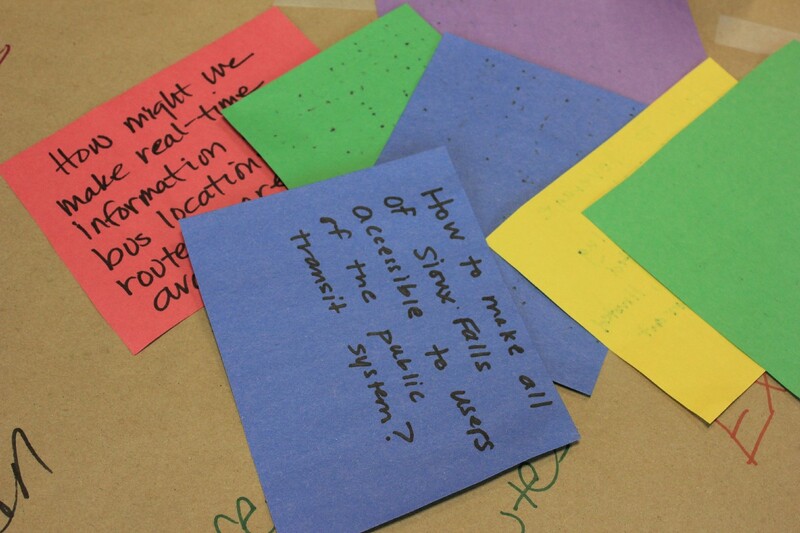 In two hours, more than 50 ideas for improving transportation service came tumbling out; at the end, everyone voted on which ideas they liked best by placing round stickers next to their favorites. It’s still early days for the Sioux Falls Core Team. They have more ideation sessions to come, and many more ideas to generate with residents. Later, they’ll pick ideas to prototype, and test out those prototypes with residents. That will give the team quick but concrete feedback they can use to tweak their ideas before the city invests real money or time in any particular solution. What the group produces probably won’t look like one “silver bullet” idea that solves the city’s transportation woes once and for all. It may instead involve a number of fixes, each aimed at different pain points in the transportation system. By the time Sioux Falls is ready to start piloting some solutions this summer, they’ll have confidence that they’re on to ideas that respond to real needs in the community, are likely to work, and represent innovation for Sioux Falls and its residents. For members of the Core Team, the experience so far has been uniquely energizing in their careers as public servants. Several said this is their first time working with people in other departments. Others said it’s exciting to work on something the mayor has made a high priority. They value the direct contact they get with him when he drops in on their meetings or posts a note to the group’s instant messaging channel on Slack. TenHaken’s hope is that each member of the Core Team will take that excitement back to their own departments and spread these new ways of thinking about problem-solving throughout local government. While the issue today is transportation, TenHaken thinks the model of building cross-departmental teams can help solve any big problem cities face today.